Bohemia Nugget from the Historic Oregon Newspapers Archives. Colette over at mysouthlane.com has a great post on the Historic Oregon Newspapers Archive. The Archive has issues of the Bohemia Nugget online. The Nugget was a precursor to the current Cottage Grove Sentinel. 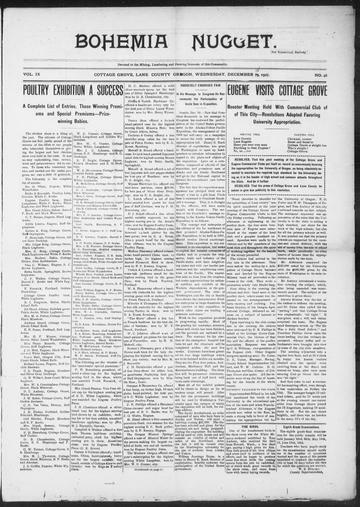 The newspapers are searchable, and by using Dorena, Wildwood, Star and Disston as search terms I was able to find lots of interesting articles about the Row River Valley in the early years. Culp Creek does not work as a search term because the town did not come into existence until 1924, years after the Nugget ceased publication. Head on over to oregonnews.uoregon.edu to take a look at the Archive. It is a wonderful resource for anyone who loves local history. It’s fun to poke around in the archives, isn’t it? This is a great post.